The Web Audio API is a powerful browser API for creating, manipulating and analysing audio. I'm no musician, so I'll leave the creating and manipulating to the experts. Instead, in this post we're going look at analysing audio. To make things extra interesting, we're going to see how to visualise the audio in a React component with <canvas>. When we're done we'll have a React application that can listen to the microphone on your computer and show a waveform to visualise the data. We're ready to start building the application. There is a button in the interface ready to grab the microphone input, but it's not hooked up to anything yet. We're going to create a function that the button will execute when clicked. Our function will ask for permission to access the user's microphone using the getUserMedia API. Then, once permission is granted, it will add the audio to the state of the application. First, open src/App.js and setup the state object in the App component's constructor. Add a method to stop the audio capture too. This loops through each of the MediaTracks associated with the MediaStream that getUserMedia returns and stops them, finally removing the stream from the state. Add a method to toggle the microphone on and off. The application is already rendering a button, but we need to hook it up to these functions. Update the render function so that the button toggles between getting and stopping the microphone input. Return to the browser and click the "Get microphone input" button. The browser will ask your permission to use the microphone and when you grant it … well, the button will change. Not super exciting, but now that we have an audio stream we're on our way to analysing it. Create a new component in the src directory for the analysis; call it AudioAnalyser.js. We're going to pass the audio stream to this component via the props. This component is going to be responsible for using the Web Audio API to analyse the audio stream and store that analysis in the state. When the component mounts we're going to setup the Web Audio API objects. First we create a new AudioContext (Safari still only supports the webkit prefixed version of this, sadly). Then we'll create an AnalyserNode that will do the heavy lifting for us. From the AnalyserNode we need to know the frequencyBinCount which, according to the documentation, generally equates to the number of data values that will be available to play with for a visualisation. We'll create an array of 8-bit unsigned integers, a Uint8Array, the length of the frequencyBinCount. This dataArray will be used to store the waveform data that the AnalyserNode will be creating. We passed the media stream from the microphone into the component as a prop and we need to turn it into a source for the Web Audio API. To do this, call createMediaStreamSource on the AudioContext object, passing in the stream. Once we have the source we can then connect the analyser. This still isn't doing any analysis for us yet. For that, we'll need to call upon the AnalyserNode's getByteTimeDomainData method every time we want to update the visualisation. Since we will be animating this visualisation, we'll call upon the browser's requestAnimationFrame API to pull the latest audio data from the AnalyserNode everytime we want to update the visualisation. To do this, we'll create a method that will be called every time requestAnimationFrame runs. The function will copy the current waveform as an array of integers, from the AnalyserNode into the dataArray. It will then update the audioData property in the component's state with the dataArray. Finally, it will call on requestAnimationFrame again to request the next update. We kick off the animation loop from the end of the componentDidMount method after we connect the source to the analyser. We'll initialise the state of the component in the constructor, with an empty Uint8Array and also bind the scope of the tick function to the component. One other thing we want to do is release all the resources if we remove the component. Create a componentWillUnmount method that cancels the animation frame and disconnects the audio nodes. In the render function include the <AudioAnalyser> component only if the state contains the audio stream. Load up the page and press the button to give access to your microphone, you'll see the array of values being generated in a <textarea>. Looking at a bunch of numbers updating is no fun though, so let's add a new component to visualise this data. Create a component called AudioVisualiser.js and fill in the boilerplate we need. Let's start this class with the render method. We want to draw onto a <canvas> so we'll render one to the page. We need to get a reference to the <canvas> element so that we can draw on it later. In the constructor create the reference using React.createRef() and add the ref attribute to the <canvas> element. Let's build a function that will draw a waveform on the canvas. This is similar to this MDN tutorial originally by Soledad Penadés, but adapted to work within out React component. The idea is to take the audioData we created in the previous component and draw a line from left to right between each data point in the array. Now we start to work to build up the picture we're going to draw on the canvas. First setting our drawing style, in this case setting a line width of 2 and stroke style to the colour black. Then we clear previous drawings from the canvas. Next, begin the path we are going to draw and move the drawing position to halfway down the left side of the canvas. Loop over the data in audioData. Each data point is between 0 and 255. To normalise this to our canvas we divide by 255 and then multiply by the height of the canvas. We then draw a line from the previous point to this one and increment x by the sliceWidth. Finally we draw a line to the point halfway down the right side of the canvas and direct the canvas to colour the entire path. Let's tie all the components up together and see the visualiser in action. Open src/AudioAnalyser.js and import the AudioVisualiser component. Define a render method that renders the <AudioVisualiser> and passes the audioData from the state as a property. And we're done. Start the application with npm start, if it's not running anymore, and open the browser to localhost:3000 again. Click the button, make some noise, and watch the visualiser come to life. 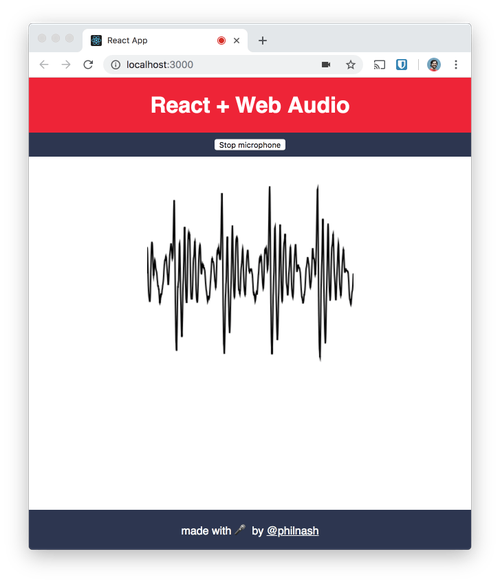 In this post we've seen how to get access to the microphone, setup the Web Audio API to analyse audio and visualise it on a canvas, splitting up the job between two React components. We can use this as a basis to create more interesting and creative visualisations. 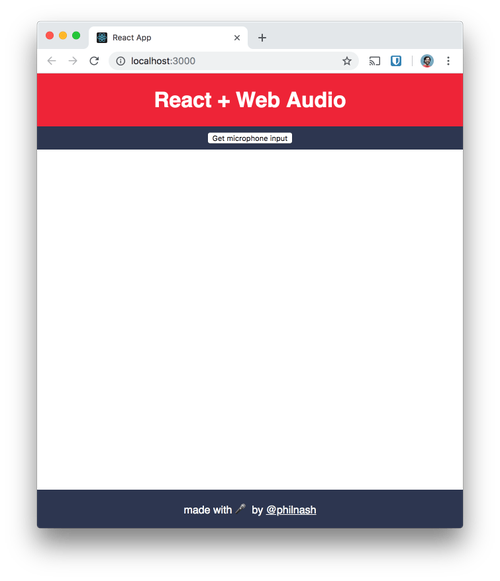 Alternatively, if you're creating a video chat in React, you could add this visualisation to show who's making noise on the call, or even to check if your own microphone is working. You can check out all the code to this application on GitHub. I recommend reading through the MDN article on visualisations with the Web Audio API to find out what else you could achieve with this. I'd love to see what other visualisations you can create, if you come up with something let me know in the comments or on Twitter at @philnash.